For web application development, Node.js and Ruby on Rails are two famous solutions of server-side. They are built around different concepts and architectures, despite the fact that both environments can manage apps of any complexity. 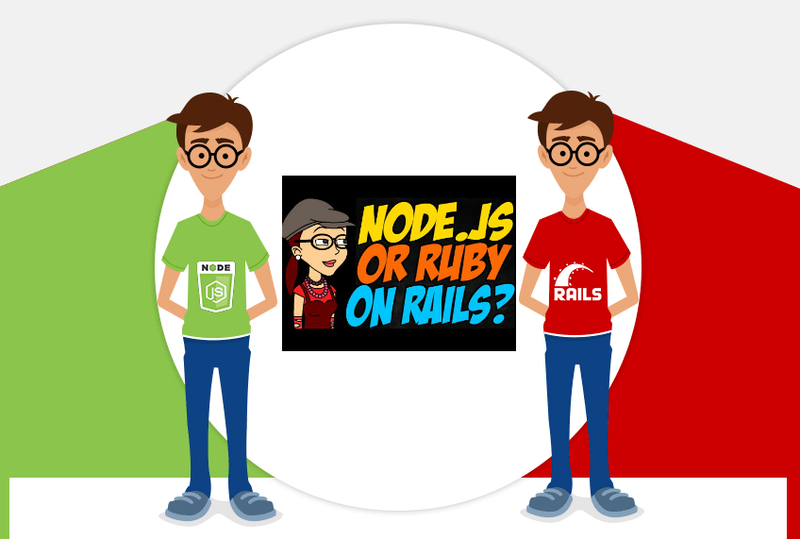 To make the final decision about which tool to choose for your project, you should be aware of advantages of both Node and ROR, and, more importantly, understand types of applications and cases where Node.js may be better than Rails, and vice versa. Node.js can handle the workload of many web servers at the same time. When a server has high load, it allows programs to keep working even the input, output demands, which help keep app performance up no matter the load. You progress quicker if you code in only one language on both the front-end and server-side. With Node.js, it’s easy to line up with front-end techniques to make effective second-gen web apps with less hassle. All depending on the workload, the mix of Node workers and clusters can easily create additional Node.js processes which make Node.js applications easy to grow. HOW RUBY ON RAILS SHOWS IMPROVEMENT? In NODE.JS VS RoR, there are also many features that make RoR a cutting edge over NODE.JS and show more improvement. The creator of RoR put convention before configuration which made RoR ship with every necessary library and module and they all implement the model, view and controller paradigm. RoR includes an integrated web server and has a database with generators and scripts which makes it easy to put together a Rails application. Automatically, you can put all the necessary bits and pieces that a functioning Rails site needs in place. You can easily migrate databases of Rails. Users of Rails can use the Rails language to describe changes to database tables instead of writing out SQL code. For the last 4 years, Node.js performance has raised dramatically leaving Ruby far behind in some peculiar cases. After talking to several developers in various software development companies in India, it was found that Ruby on Rails technology has started to lose its ground. That means that the demand is dwindling among the whole industry and employers respectively. On contrary, Node development continues to strengthen its position yearly. However, Node.js should not be confused with a web framework shipped with controllers, database integrations, routers, and other handy tools to facilitate web development. Ruby on Rails is much closer to that since it is quite a rich ecosystem consisting of small packages which, summed up, create solid web applications. It is an easy decision and you should use Node.js if your application has items that absolutely need Node.js. Favor the stable choice – Ruby on Rails if your application has needs that Ruby on Rails is more geared towards or all else is equal. The truth is that there's potential for things to go wrong with either of these frameworks. Do not pick a framework because all the cool kids are doing it and based on hype. Determine what the application should do and then choose the framework that works best in less time. Tech leads working in most of the software development India agencies use this method to pick the best suited framework as per the requirement.